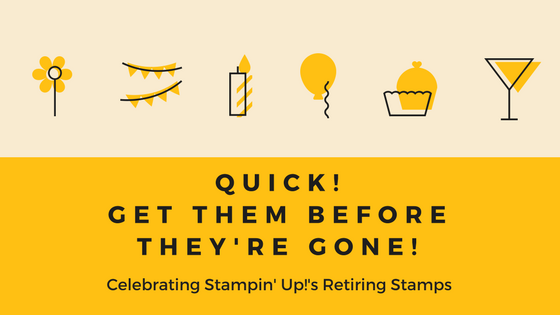 It's officially May which means it's time to say goodbye to all the retiring stamp sets. In total, I'm losing 18 stamp sets from my collection (although a few of those will be kept because I love them so much). Many of these stamp sets are still available, but they are no longer guaranteed. If you want any of the sets featured, buy now before they are gone! Today's quartet of birthday cards is a direct CASE from Bree @ Craft-somnia Momma. How could I not CASE these? They are the perfect simple birthday cards to highlight the fun images from the Magical Day stamp set and the pretty Myths and Magic DSP (sadly discontinued already).